The end of a promotion is controlled through the dates of the promotion set up in the Editor. You can set up the dates by going to Editor > General > Dates. The dates of the promotion are always editable. End of publication date: When this date is reached the promotion status changes from active to expired and the promotion is unpublished by default. This means that the promotion link shows a blank page with a message that reads "promotion expired". The administrator can edit this message or even republish the promotion. 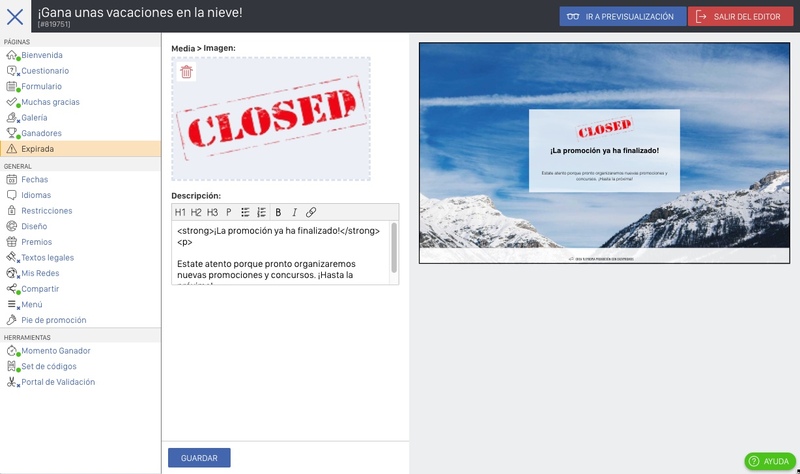 See "Manage the visualization of a promotion that has expired". End of entry date: This date must always be less than or equal to the end of publication date. If the promotion has reached the end of entry date but not yet the end of publication date, the promotion will be active and will remain public, but the entry form will be closed to new entrants. The promotion will show a "closed" message on the Welcome page. 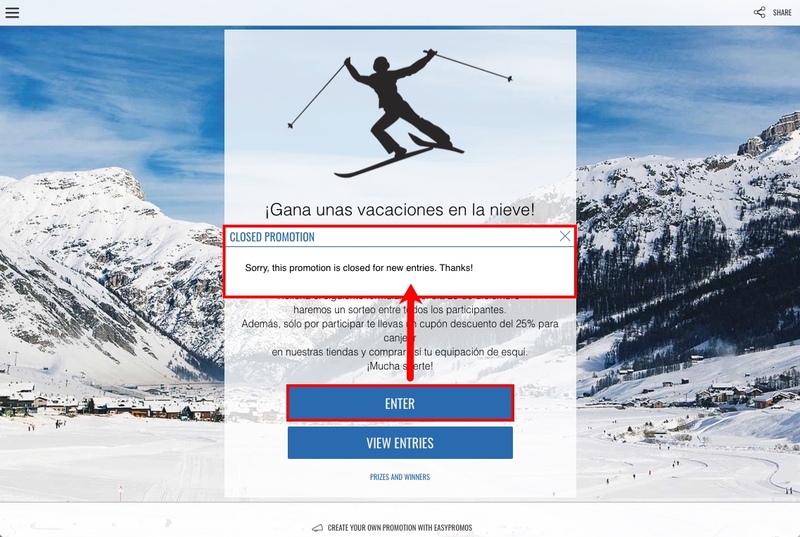 Note: If the Welcome page is unpublished the promotion will show the message of "promotion expired". End of voting date: This date must always be less than or equal to the ond of publication date. If the promotion has reached the end of voting date but not yet the end of publication date, the promotion will be active and will remain public, but the voting will be closed in the public gallery of participants. The promotion will show a "voting closed" in the Gallery page. By default, once the 'End of publication date' has been reached, the promotion is unpublished and is no longer visible. 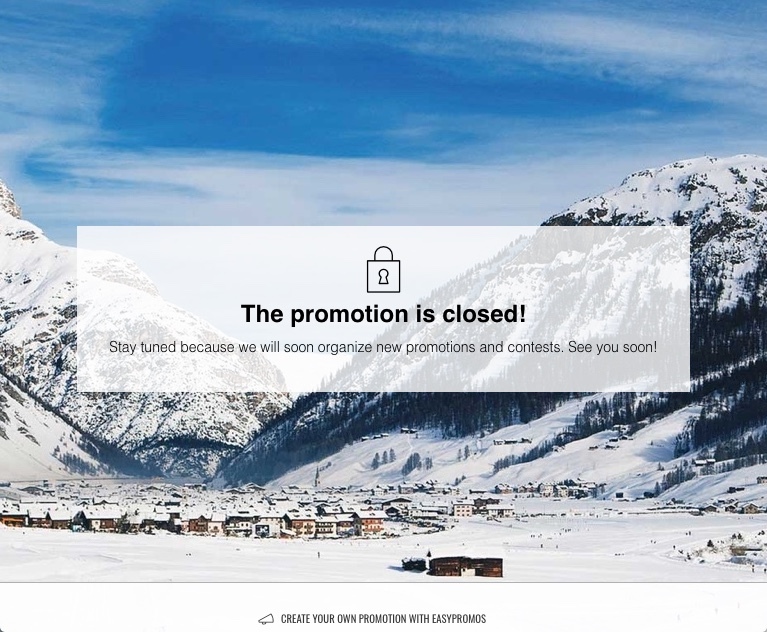 The "expired promotion" screen is displayed. This screen can be edited from Editor > Pages > Expired. An expired promotion can be republished. This case is useful to show the photo contest gallery permanently or show the page with the winners or simply show the Welcome screen of the promotion when the promotion is closed. You can also redirect the main link of the promotion to an external URL. To show the promotion again or change the type of content that the URL shows, go to the promotion management page, where you will find the 'Promotion status' section in red. From there you can decide what you want to show in the link of the promotion. Show expired promotion page. It is the default behavior. Users visiting the promotion URL will see a blank screen with the message "The promotion has expired". You can edit this message by going to Editor > Pages > Expired. Show promotion. The promotion landing page will be shown again, but participation won't be active. Show winners. This option appears when the winners page is published. You can lead your promotion visitors to directly check the winners. Show gallery. The entries list page will be shown again. Redirect to URL. Use this option if you prefer to redirect to an external web those users who visit the promotion URL when it is already finished. It will allow you to write the URL domain and users will be redirected there. The promotion can stay visible all the time you want.